Depsite repeatedly vowed to be the best of the 3-screens (computer, tv, mobile), Microsoft keeps being out-innovated in all three. And, developer is moving away. Windows Media Center is selling on the promise of doing typical TV operation with ease and coolness, plus occasional use to browse the web, including Youtube and some peer-to-peer video has been the selling point. I picked a WMC over an XBox to keep Bluray in the same box. I have been an advocate of "Windows Media Center", but I was considered to move away after the power-supply of my WMC dies. It was because the experiment has not been smooth. Playing a Bluray always requires me to use 3 remotes and almost everytime, a mouse. It is partially because of the 3rd party software. But, then WMC didn't give me a choice, because Microsoft didn't make one. I watch very few movie at home (less than once a month), so I usually not deterred by a couple $ different on price. Launching a VUDO demo video there is faster than me launching the Bluray that is already in my Bluray drive. And, I am not forced to watch over 5 min of junk which each Bluray disc force me to play. Now, back home. Windows Media Center doesn't support VUDO. Non it runs Windows on itself. It has been a repeated theme that Windows are the last platform for anything cool. Hulu, Netflix streaming, Amazon streaming, and now VUDU.com. This MAV pattern gives a few advantage over MVC. The controller-less pattern is more restrictive but allows better encapsulation, composability and reusablity (ECR). ECR is possible because the patterns greatly simplified the message flow each component responsible for. Coupled with jQuery events binding, each components is self-contained, receives a single set of message and send messages to a single sink type. When a widget is initialized, it binds itself to the known model. It also bind itself to any jQuery object events. From the model, a widget receives well defined CRUD-like events. From the DOM, it receives well defined widget events (click, mouseover, change etc). It is completely reactive, making it easy to write and predictable. View is defined as a collection of widgets. 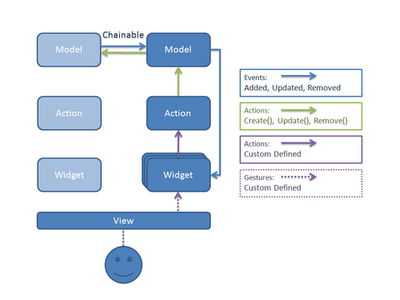 Notice that a model can be chained to a upstream model. An upstream model can be either a superset of equal set of the downstream model. The beauty of the design is that the upstream model can be located remotely. They can be connected with HTTP server over RESTful service. MVA patterns allows both Action and Model to be resides on a remote server from the widgets. I am able to build a 6000 lines "mobapp 2.0" app without violating the pattern. It is not entirely easy in situation where some components want to talk to multiple model. I worked around it by introducing the concept of Relation, in which Relation is a model holding entries with pairs of ids. I am adding a new wiki. I think it is the best things happened to Facebook for a long while. I had said it long ago (2 years?) that Friendfeed completes my social network needs. Technically, aggregation is the way to go for the ultimate network effect. However large you're, you cannot cover everything. And, some of the major Waterloo in technologies happens when a large company believes that they can makes existing best of breed change for them, and makes it the only option. Examples are WinFS, where they designed it to be useful when everyone changes their file format in order to join WinFS. Oracle's Database Filesystem is another. Same for Cardspace and other identity service. Google search (and Desktop search) is the most representative a successful aggregation. Instead of requiring how a webpage should look, Google, the Aggregator, invests in the bridging, gopher, and pull in everything. It works better for standard conforming page, but still works for other. Desktop search (from both companies) is much less than the vision of WinFS, but then it works because it doesn't require you to change Microsoft Word's file format for it to be useful. I predict Google Wave is another major Waterloo. The UX of Google Wave is superb, and the scenario is simply convincing. But instead of aggregate, it requires you to embed the Wave app and dictated Google as the only storage. It would be nice to them and user if they can pull it off, but I doubt it. Unless the figure out a way to include the best of breed to come or already out there, I don't see that they can go very far. Dreams of an "Engine Company"
Maybe Dreams of Engineers too!? It is a well-made "commercial", feeling bad calling it so, but I don't know what else to call it. It definitely improves my perspective on Honda. Totally inspirational. I love it. I think I am failing every day. Since the day I started the ideas on leafsoft.com, there had never been a day when I felt I finished enough. Sometime I lost to distraction; lost to urgent things that are not as important; lost tireless; sometime I just wanted to finish more; I struggle to become more productive, to ignore unimportant things, to find the right balance to allocate time between tools and end product, to stay focus (which is one of the hardest). I doubt everyday am I smart enough for my goals. I think the differences between stupidity and admirable endurance are hair thin. One is you do exactly the same things and never stop; the other is you do almost exactly the same thing and never stop. The video gave me a powerful push today. I know I won't finish as much as I wanted today. I know I am not going to settle for less. I tried to ask myself for less, I couldn't. The 500 Millions App downloaded is amazing. It is even two years since it comes out. Welcome to 2009. A year's just started! Time to renew the blog habit, and do some new year reflection. This blog was most active in the beginning of 2006. At that time, I was working for a mid-size software company on their Eclipse IDE product in Fremont Seattle. (I missed the day I walk to work, and the coffee shops around.) While I loved the tools, working in UI wasn't exactly what I wanted to build my career long term at the time. I liked to drive deep and interested in Transaction, Caching, O/R kind of stuff, which was what I learned from my first paying jobs. I wanted to continue on that, so I registered http://cacheca.com (it is like my 8th idea) and worked a bit on my own on distributed cache. Read and think a lot on the topic and that was why I have much to write on that. I joined a large software company, a clustering project, on the manageability team. I was hoping my knowledge on the my previous work will be useful. In the beginning, I was really wishing to join for the engine side of the team. (I am still on manageability but no longer under the stealth project. The org structure makes sense, manageability at scale has much border application than scaled up or scaled out server. Manageability at scale is the manageability problem.) It is only natural for a critical server product to work on scalability, but it was a stealth project so I didn't try blog about work. Sometimes, a lot of the inspiration is coming from work. Without blogging those, I simply blogged much less. After joining the company, on my own time, I shifted a little bit and develop a hobby project which was related to social network. I thought an open-platform can be game changing even against fierce competitors. I was looking at the online-identity (eg, openid.net) stuffs for that idea. On a thick stack of loose-leaf papers I drawn the idea, algorithm, and page flow, etc. In code, I didn't go too much beyond coding the login authentication logic (separate login server, passing obfuscated token with page redirection etc. It was interesting to understand what all these HTTP 3xx code about.) Well, I have witnesses on open-platform social-network idea. When facebook came out with their own, and I looked at their initial API, I knew they got it. (I only have the idea. I am not even close enough to any result to feel sour about. Result is everything.) Online-Identity actually become less relevant because of it, imo. Shall the killer app at the time uses online-identity, the landscape might look quite different today. Success is path dependent. It is also the network effect. Busy at times for different reasons, and phew! 3 years have passed. Looking forward, there are a lot more interesting problems calling (and even screaming) for solutions. 1) Phone hardware (and even OS) is certainly coming to the rip time. Time has comes for a computer on everyone's hand. 2) As more interesting web apps emerge independently, there is also data scatter problems. 3) We are also tearing ourselves by letting too many irrelevant notifications interrupted us for the fear of missing some important one. I start to think that the last piece of puzzle of Turning Test is not AI (Artificial Intelligence). It is not a problem about intelligence. (Intelligence is like a cocky joke at the right moment that makes everyone laugh.) The last piece of puzzle is something much more predictable and readily extract from the memory we have. Someone can be very human even when he don't do any cocky joke, but share some common memory with you. You will feel closer (and more human), if someone reminds you that you two shared the feeling on an anecdote. This year, I am working on the solutions on these problem. They are not as complicated to solve as it appears, and they overlap a lot. Those are going to be blog topics this year. Stay tuned! With English as my second language, I occasionally use “Internet Search” to check expression that I am about to write down. I aware that sometimes a phrase that I come up might not be the way a native speaker would express it. Sometimes, what I feel a bit odd might be quite regular to him/her. I tried it on Google and “Microsoft’s Live Search”. It demonstrates again Google has superior linguistic analysis on the query (and what is indexed) than Live Search. With Google, the first link is a video that is an exact match. The other links has a title “Knock outs sweet heart”, “Knock out my heart” and “Knock against my heart”, etc., which *mean* similar thing as my input query. With Live Search, all the links are random with the words “Knock” and “Heart”. Imagine it is a Tuning Machine test and I ask “show me something that has the expression of knock on the heart”. Google, as robot wrapped in a human-like skin, replies, I know a video on “You tube” has the exact same title. I know Skechers has a line of shoes called “Knock Outs Sweet Heart”. I know Deidre wrote a blog entry about an Auto Show at Geneva. The title is “K.O. Cars Knock Out My Heart”. Live Search, as a pretty lady, replies, I know a joke “Knock-Knock Jokes for the young-at-heart.” I also know “Maisie is the heart of Knock Knock.” My reply? Eh? Conversation ended! I won’t bet on Google Android yet. Has Google convinced me that he understands the messy aspects of how to build a platform to allow third party development? For a platform to gain momentum, they really need some killer apps with it. The killer apps and platform is a chickens and eggs that need be solved at the same time. I am not saying Android cannot succeed, and Google maybe cooking something right under the cover. But, nothing is shown. Also, observed those who can do an killer app is not on-board. None of Sony, Nokia, RIM, MSFT, Apple are onboard. Apple iPhone has the most proof so far. iPhone has succeeded as a killer app, and it invertible to become a great platform, even Apple tried to resist to become a platform. iPhone even has killer app using Google Map service. If Andriod gains any momentum, iPhone just need to drop the price. Windows Mobile always has the old bags for the killing apps: Pocket Word and Excel, and most important deep integration with Outlook (Contacts, Calendar, Corp mail). The ability to stay in the game cannot be questioned. RIM, Nokia and Sony are still making products that interest some segments of customer without Android. They’re probably going to stay in the game until they make very big mistakes on their own.